This refillable cruelty free Felt Tip Eyeliner is designed to suit the most sensitive eyes. It uses high quality COSMOS certified organic ingredients. This eyeliner is also refillable, helping to reduce waste. Cruelty free & vegan. This refillable Felt Tip Eyeliner is designed to suit the most sensitive eyes. It uses high quality COSMOS certified organic ingredients. 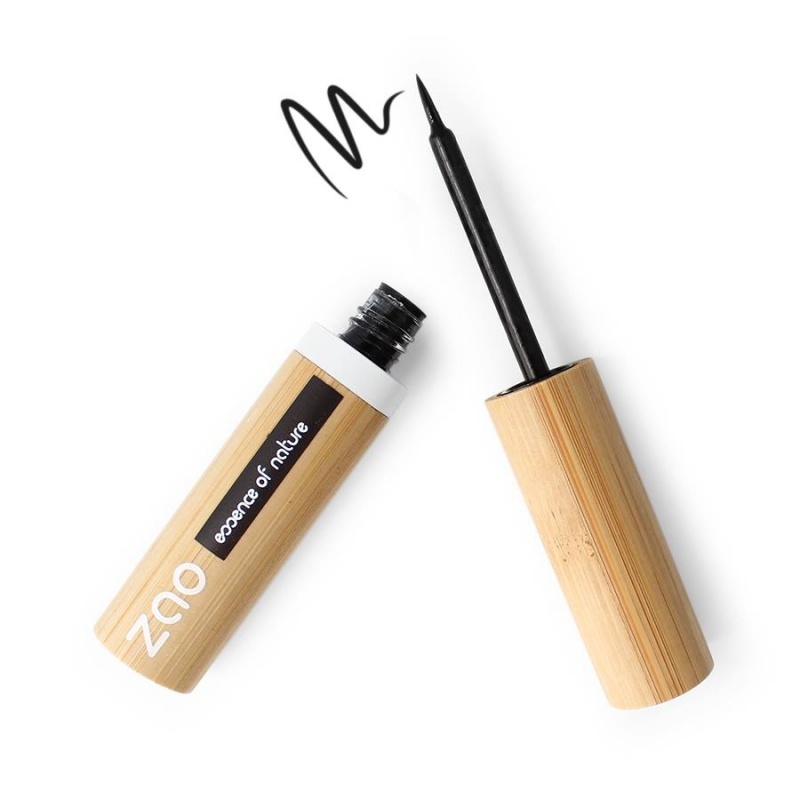 This eyeliner is also refillable, helping to reduce waste. The felt tip design makes applying eyeliner easy, even for those who struggle to apply liquid eyeliner with a brush. This eyeliner is cruelty free & vegan. The formula is enriched with aloe vera that cares for eyes and delivers an intense black colour. Packaged in a stylish, varnished bamboo case that is durable and sustainable, the product is presented in a cotton pouch with drawstring to protect the bamboo packaging. This vegan friendly makeup is has not been tested on animals & is suitable for all skin types, specifically sensitive eyes and skin where the natural ingredients reduces risk of redness and irritation. Organic aloe vera juice : Known for its soothing properties, organic aloe vera juice nourishes the delicate eye area. Organic bamboo water: This moisturises and soothes the delicate eye area. Organic acacia gum: From the acacia senegal tree, this is a natural bonding agent to boost the eyeliner's staying power. Organic shea butter: Shea butter derived from the fruit of the shea tree, a natural moisturiser and soothes the skin. HOW TO USE: Shake prior to use. Did you know the thickness of the line depends on the amount of pressure you apply? So, for a thin line, press the brush lightly; for a thicker line, apply slightly more pressure. On the upper eyelid, paint the line on the closed eyelid close to the roots of your eyelashes. Always ensure you start from the inner corner and move towards the outer corner of the eye. A certified organic and cruelty free make-up range, offering natural, sustainable packaging.